Sometimes, when you attempt to attach a TEAMserver Translation Memory or Termbase to a project, Déjà Vu will tell you that it was unable to do so. It will usually give you a reason for this, and you can use this information to help you understand what the problem is, and what you can do about it. Déjà Vu X3 was unable to connect to http://teamserver.example.com/TEAMserver. Please check the URL you specified and make sure it is valid. Using the wrong letter case. The TEAMserver part of the URL must be spelled exactly as shown here. Not entering the /TEAMserver part of the URL, when using the HTTP protocol. Entering the /TEAMserver part of the URL, when using the TCP protocol. In this case, you should type only the DNS name, or the IP address, or the TEAMServer, and nothing more. If it is not possible to connect to the TEAMserver at all, e.g. because the server machine is not responding, or because your network connection is malfunctioning, or there is a firewall between you and the TEAMserver that is blocking the connection, Déjà Vu will not be able to establish a connection with the TEAMserver. In this case, it will tell you the same thing it would if you had misspelled the URL. If you suspect this may be the case, check the status or your network or Internet connection, and check the status of the TEAMserver machine itself. If you cannot do this yourself, ask someone who is able to. Déjà Vu X3 was unable to connect to http://teamserver.example.com/TEAMserver/. Please check the login credentials you specified and make sure they are valid. The username and password are spelled correctly. This includes using the right letter case. That the username or password have not been changed. If they have, use the updated credentials. That your account on the server has not been disabled or deleted. That you are using the correct URL. If you work with 2 or more TEAMservers, it's possible that you are unwittingly providing Déjà Vu with the URL to one of them, but giving it the credentials that correspond to another. If, after having done all this, you find that you are still unable to attach a Translation Memory or Termbase to a project, you can use a diagnostic we have made available. This tool will send a request to the TEAMserver you specify. It will then display information about the response it receives form the TEAMserver, which you can read yourself, or add to a new Ticket. Unzip the contents of the ZIP file to a temporary location, on one of the computers where Déjà Vu has trouble connecting to your TEAMserver. In the URL field, type the address of your TEAMserver. Use the same URL you tried using in DVX3. Type in the same username and password you tried using in DVX3. 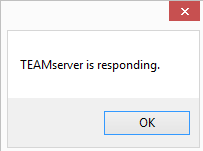 The TEAMserver will display a dialog window showing the response returned by the TEAMserver. If the response shows a problem, you can read it to identify the cause, or take a screenshot of the information and attach it to a new Ticket.